Landlords and property managers keen on speeding up the rental inspection process may appreciate a new tablet app that helps them organize and conduct inspections for different property types. That’s exactly what Chapps Inspector does — and it’s compatible with an iPad or Android tablet. The app lets users tick off a walk-through checklist when conducting inspections, add descriptions and features, snap photos, and create sketches. Screenshot showing Chapps Inspector report page. Following an inspection, users can quickly bundle their findings into a report that tenants and landlords can sign on the app to testify to the condition of a unit. 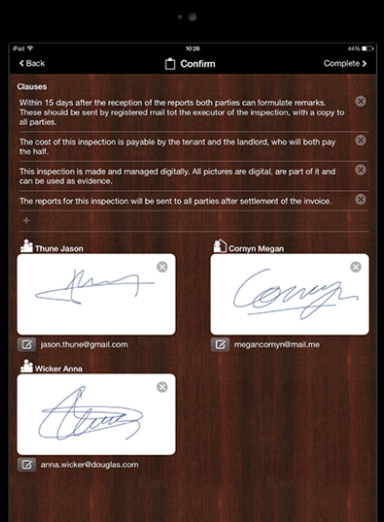 The app’s workflows and report templates support a wide range of inspection types, including those involving the beginning or end of a rental agreement, intermediate checkups, damage assessments, renovations and repairs. The basic version of the app is free. Paid versions offer additional features, such as the ability to specify cost estimates, store reports in the cloud and view the status of inspections in a certain area on a map.